If you're planning to visit us for the first time, you may have many questions on your mind. Below are frequently asked questions by our clients. For any additional inquiries, contact us at (631) 667-4166. Q: When should an adult's eyes be examined? Young adults (ages 20 - 39) should have their eyes examined every 1-2 years. Adults ages (ages 40 - 64) should have their eyes examined every year. Seniors (over 65 years of age) should have their eyes examined every year or sooner if visual symptoms occur. People with diabetes, hypertension, or other systemic circulatory conditions. People with glaucoma or strong family history of eye disease. People experiencing visual symptoms such as flashing lights, double vision, redness or pain. 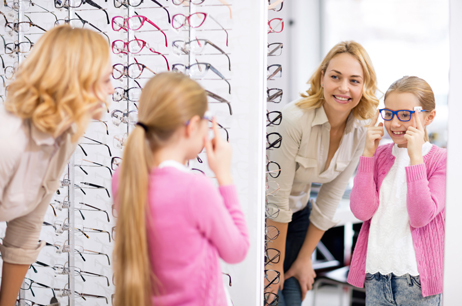 A: Children should have their first comprehensive eye examination no later than by age 5. If you suspect your child suffers from decreased vision - amblyopia (poor vision in an otherwise healthy eye), refractive error (nearsightedness or farsightedness) or strabismus (misalignment of the eye in any direction due to weak eye muscles, the eye may be turned in or “crossed” or turned out “wall eye”) - or if there are hereditary factors that might predispose your child to eye disease, please make an appointment with an optometrist as soon as possible. New techniques are available by specialists to test vision in infants and very young children. "I had a pleasant visit at this office!" A: Glaucoma is a potentially blinding eye disease which consists of optic nerve deterioration resulting from intolerably high eye pressure and/or low circulation and nourishment. The high pressure, over time, permanently damages the optic nerve resulting in first a permanent loss of peripheral vision and then finally central vision. Diagnosis includes measurement of subtle to severe peripheral vision loss and optic nerve inspection as well as checking the intraocular pressure, usually by using the “air puff” instrument. Important risk factors include family history, age, race and systemic health. If left untreated, this disease can cause blindness and there is no cure. However, early detection usually prevents further loss of vision. A: This common problem can occur at any age but is usually present in patients between the ages of 65-70. Cataracts are cloudy areas in the lens inside the eye which is normally clear. Cataracts can develop in one or both eyes. If they develop in both eyes, one is usually more severely affected than the other. A normally clear lens allows light to pass through to the back of the eye, so that the patient can see clearly. If a part of the lens becomes opaque light does not pass through easily and the patient's vision becomes blurry - like looking through cloudy water or a fogged up window. The more opaque (cloudier) the lens becomes, the worse the person's vision will be. Q: Do computers, video games or lots of close work such as reading cause the vision to get worse? A: Computers represent the number one source for workplace discomfort, but their use does not harm the visual pathway nor do video games or extensive reading or other near point visual activities. Looking at the screen will not harm the eye or change its refractive power, however, spending all day in front of a computer monitor, or video game, or mobile device can induce eyestrain or eye fatigue, dry eyes, burning, light sensitivity, blurred vision, headaches and pain in the shoulders, neck or back. Here are some proven steps that can help you avoid computer vision syndrome, and make you more comfortable at the workstation: Turn off lights adjacent to the monitor or behind the computer. Illumination from behind the person works best. The desktop should be about 2 ½ feet from the ground. Position the monitor and/or chair height so that when looking directly at the monitor your line of sight is directly at the top edge of the screen. This generates a slight downward gaze - most comfortable for long work periods. The screen surface should be approximately 30 inches from your face. 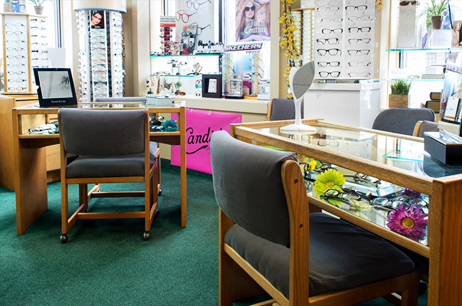 If you are a trifocal or progressive wearer, it may be necessary to lower the monitor height or raise your chair even more so the intermediate portion of the lens focuses properly.